↑ Holtzman, Jon (2009-03-15). 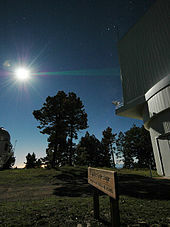 «﻿Apache Point Observatory: Facilities, Operations, and Partnerships﻿». Astro2010: The Astronomy and Astrophysics Decadal Survey (National Academies). http://www8.nationalacademies.org/astro2010/DetailFileDisplay.aspx?id=438։ Վերցված է 2012-01-14. ↑ «Annual Reports of Astronomical Observatories and Departments: Apache Point Observatory, Astrophysical Research Consortium»։ Bulletin of the American Astronomical Society 24: 17։ 1992։ Bibcode:1992BAAS...24...17. ↑ «Annual Reports of Astronomical Observatories and Departments: Astrophysical Research Consortium, Apache Point Observatory»։ Bulletin of the American Astronomical Society 27: 9։ 1995։ Bibcode:1995BAAS...27....9. Apache Point Clear Sky Clock Forecasts of observing conditions.